· Learn Effective Self Defense in only weeks! In the present economic climate, the streets just aren't safe. A street thug wants what you have. Police no longer respond to burglar alarms and most people cannot afford the luxury of elaborate security systems and private security patrols. So its you against them! Learn to protect yourself, your family and your property. Make lessons in self defense an important part of your family's security preparations. RECENT TERRORIST ACTIVITY POINTS OUT THE NEED FOR LESSONS IN COMBATIVE SELF-DEFENSE. Men and Women should not check-in their safety with their luggage. Additionally, in the present military climate, your young man or woman may be called to fight. Hand-to-hand combat training in the armed forces is nil to non-existent. Kung-Fu San Soo is not a sport, but an effective and efficient fighting technique, utilizing punches, kicks, throws and leverage. Kung-Fu San Soo is presently being taught to the Navy Seals and the US Marines in special auxiliary classes. Our fine youth class is structured, appropriate and fun! Activities are varied frequently to keep an exciting pace. The instructors are excellent role models and will help your children develop confidence and discipline. Because of this our San Soo kids do better in scholastic and social situations. 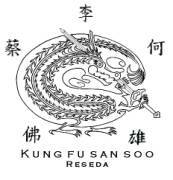 Kung-Fu San Soo, Reseda is celebrating its 41st year in business, offering professional self-defense instruction for the whole family. At Kung-Fu San Soo, Reseda, our curriculum is designed to teach the combative skills necessary to deal with dangerous, assaultive situations. Learning Kung-Fu helps the student develop confidence, a quality that, in itself, is a deterrent to hostility. The learning process develops self-discipline and awareness, often enhancing job performance and interpersonal relationships. Best Wishes for continued excellence.